How much does it cost to travel to Yangshuo? How much money will you need in Yangshuo? ¥106 ($16) is the average daily price for traveling in Yangshuo. The average price of food for one day is ¥57 ($8.53). The average price of a hotel for a couple is ¥74 ($11). Additional pricing is in the table below. These average travel prices have been collected from other travelers to help you plan your own travel budget. A county of the city, Guilin, Yangshuo is located in a region famous for its karst topography. Surrounded by jagged mountain peaks and bordered on one side by the Li River, Yangshuo has become a popular home base for tourists looking to explore the region's natural wonders. Backpackers and tourists, both foreign and domestic, come to Yangshuo every year making it a city of many cultures. Most locals are even able to speak English, which is fairly uncommon for Chinese cities. Following the course of the Li River will bring any visitor past some of the region's most beautiful natural scenery. It winds effortlessly in and around a stark mountain landscape, past traditional villages, bamboo groves, and local farmers at work in the fields. With mysterious caves embedded deeper in the mountains, Yangshuo and the surrounding region offers opportunity to explore a truly unique landscape. Another waterway, the Yulong River, is a tributary of the Li and meanders through bamboo forests, rolling hills, and picturesque rural life in the paddy fields. 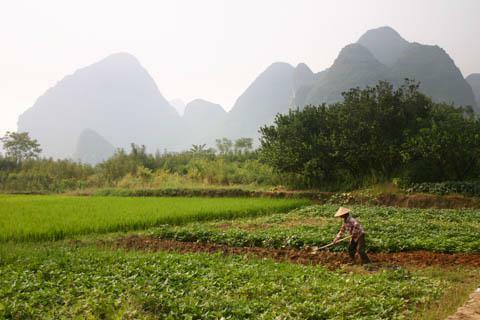 Perhaps the most notable feature of Yangshuo's scenery is Moon Hill. Located just outside the county, it is a hill with a natural arch through its center. The semicircular hole is all that remains from what was once a limestone cave. It is a very popular tourist attraction and offers panoramic views of the surrounding area for those who traverse the incline. Yangshuo is well known for West Street, one of its oldest and most bustling neighborhoods. It is a place where east meets west and cultures collide to create an environment of eclectic activity from souvenir shopping by day to dining by night. The road is completely laid in marble with a simple courtyard-like setting and has opportunities to try flavors from all walks of the world. Attracting more tourists than natives, it is sometimes referred to as the foreigner's street or the global village. A popular local dish of the village is the beer fish. Caught fresh from the Li River and prepared with a delicate sauce it is said to taste great with beer. Some popular cafés include MeiYou Café, Anne's Art Café, and Paris Café. Visually, culturally, and flavorfully, West Street is a neighborhood of the world. With winding rivers, impressive karst mountains, and sweeping country side, the Yangshuo region is a draw for all outdoor activities. Some choose to explore the village and countryside by bicycle, while other engage in bamboo rafting, enjoying the tranquil pace of nature as they are ferried along the river. Still many adventures are best done on foot, with limitless opportunities for hiking, rock climbing, and exploring caves like the Assembling Dragon Cave. Surrounded by peaks, like circling dragons, the inside of the cave is host to stunning stalagmites, stalactites, stone pillars, waterfalls, and underground rivers. It is located along the Ten-Mile Gallery, a picturesque road stretching from the Yangshuo town area to Moon Hill, endowed with rolling hills, endless fields, idyllic villages and clear rivers on both sides. This, too, is a wonderful activity for those looking to sight-see along a scenic route. Beyond its scenic wonders, Yangshuo is also host to the world's largest natural theater which utilizes the waters of the Li River as its stage. It is called the Sanjie Liu Sing Fair, and puts on spectacular shows against a backdrop of mist, rain, moonlight, twelve hills, and their inverted reflections in the river. The performance includes music and visuals from traditional culture of the region, with myth and legend for inspiration as well. One of the most significant dishes of Yangshuo is the Beer Fish, fried with its scales and then stewed with several seasonings including local beer, chili, agarics, and tomatoes. It is said to taste fresh and tender with a hint of spice and delicate sweetness. The Niang dish is also popular, which involves a unique method of combining ingredients for stuffing, as well as Lipu Kourou, which is made with taros (a root vegetable) and pork. Some recommended native food restaurants include Fusheng Yuan Restaurant, Huangjin Lian Restaurant, and Sister Chen Sidewalk Beer Fish Stall. As mentioned earlier, you can also find many dining options along West Street, including western fare like authentic pizza, sandwiches, and even a KFC. Guilin Liangjiang International Airport is the nearest airport and has about 44 airlines to most large cities in China. It is located in Guilin city, about 40 miles north from Yangshuo. South Railway Station in Guilin has regular buses directly to Yangshuo. The county has over 50 battery-storage cars serving as its public buses. They are clean, comfortable, free of pollution, and quite cheap. Motor tricycles are also common and shuttle around the county just like taxis. Because the county is so small, Yangshuo is very navigable on foot, though it is also great to explore by bicycle. Various bicycles can be rented from hotels or stalls along most streets in the county.